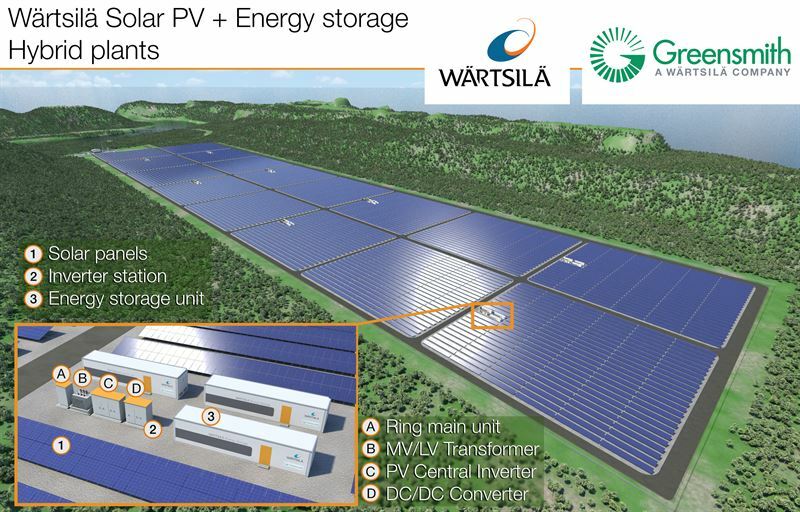 The technology group Wärtsilä introduces a new hybrid solar PV and storage solution. Wärtsilä Hybrid Solar integrates solar PV generation and storage to deliver a true “renewables as baseload” solution that is not only climate-friendly, increases resilience and efficiencies but can be supported by a power producer’s existing grid infrastructure. A critical component in maximising the value of the hybrid solution is the software and controls platform that optimizes its performance. Greensmith Energy, a Wärtsilä company, develops and deploys the GEMS platform, now in its fifth-generation. GEMS enables intelligent energy applications that focus on monitoring and operating energy storage power plants and hybrid power plants formed by energy storage, thermal generation, and renewable sources. GEMS ensures system optimization of both energy storage and generation assets through changes in market conditions and rate structures – effectively "future-proofing" energy storage investments for both power developers and regulated utilities. Wärtsilä introduces the new Hybrid Solar at Intersolar Europe 2018, the world’s leading exhibition for the solar industry, at Messe München exhibition center in Munich. Wärtsilä, located in Hall B2, booth #154, will host an event to mark the launch of Hybrid Solar on Wednesday, 20 June from 14:00-15:00. Intersolar attendees and members of the media are invited to attend.